LEGO Bionicle The Journey to One may only have 2 seasons, but the fan love is strong! Enjoy LEGO Bionicle shows, toys & books with my ultimate fan guide. A couple years ago Netflix and LEGO Bionicle saved Spring Break for us. We had two kids on different schedules and as a working mom, the juggle was real. As my oldest finished a week and a half of Spring break my youngest started his week and a half off break. 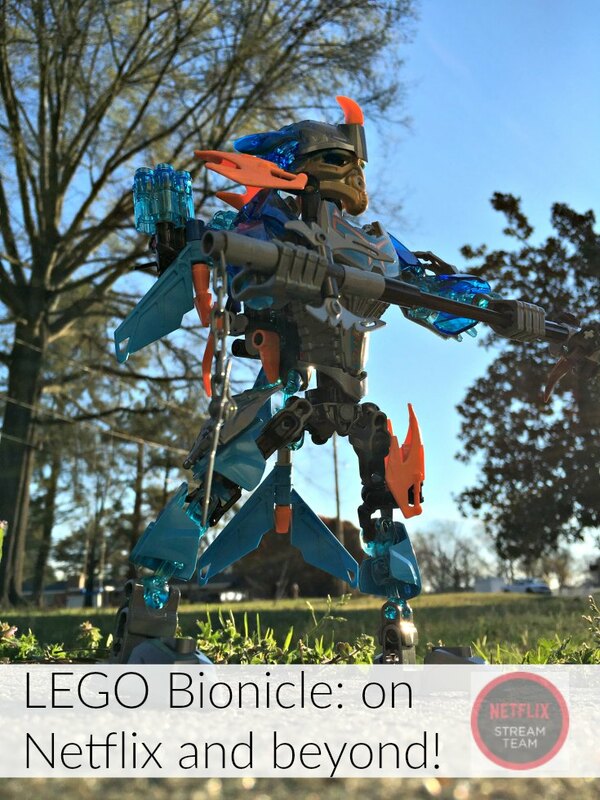 Enter LEGO Bionicle. We are huge fans of all things LEGO, so when I received a box containing not one, but two LEGO sets to put together the day before break started, I whispered a hearty thank-you toward the sky! 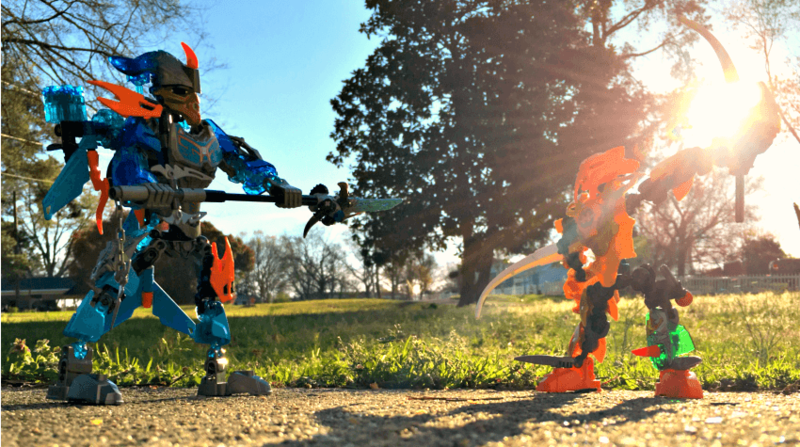 We’ve never had a Bionicle set before so after Calvin left for school, I set Oscar loose with the set (Gali – Uniter of Water) and he had a great time building it. He played with that and the other set (an awesome LEGO Friends Birthday Party) for hours, which meant I could get some work done. Win Win! I let the fun of the toy stick with Oscar before telling him that Netflix has an original series called LEGO Bionicle: The Journey to One. 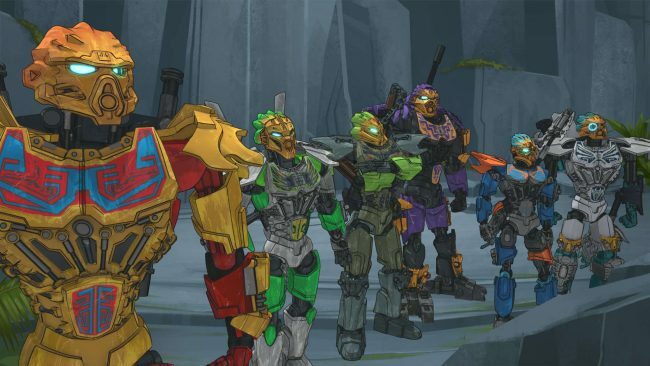 The story is an epic tale of good vs. evil with each Bionicle harnessing the power of nature’s elements. We’re very excited for the next episodes to roll out so we can be sure the bad guys are defeated! Age 7 is a really great age for imagination and discovery. Especially during a very long and at times boring Spring Break at home. Oscar loved watching the shows and playing with his sets, but after a visit with his older cousins, he was even more hooked! My nephew was a fan of the first generation of Bionicle and Hero Factory and let Oscar go through his own personal stash to create a completely unique figure! He’s fierce and Oscar will be sure to let you know all about how awesome he is. But wait! There’s more! 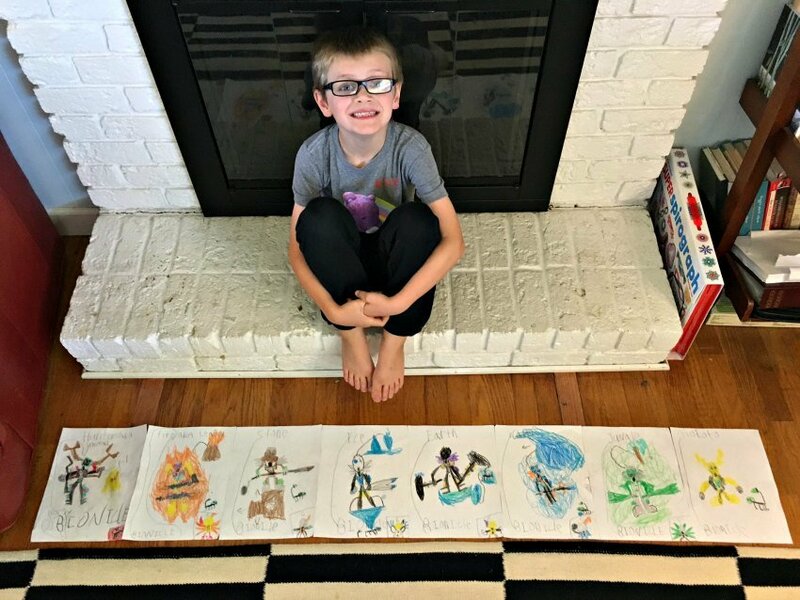 Oscar spent hours creating a page for each Bionicle from the show including their element, their creature, and their names. And now that he is back in school, he has checked out a couple of the LEGO Bionicle chapter books from the older series. I think it’s safe to say we have quite the fan on our hands! So if the Grinch can steal Christmas, then LEGO Bionicles and Netflix can certainly save Spring Break! If you haven’t seen the show yet, check it out along with lots of other great LEGO shows on Netflix and see where your imaginations take you. I loved watching Oscar explore play, art and reading just from the inspiration of a toy and a couple shows. I love how your son took the story off the screen and continued to play and act out the themes in real life with the toys and through his INCREDIBLE artwork. Seriously you need to frame all those beautiful pictures! Both of my kids would be all over this! And look at how incredibly creative Oscar is! It’s so great to see how a show can inspire art and creative play. Glad to have found you. The kids today really have the entire experience with toys and shows coming home with them. Love the pictures you included! Your son is very creative. Thanks for sharing. My boys would be all over this! 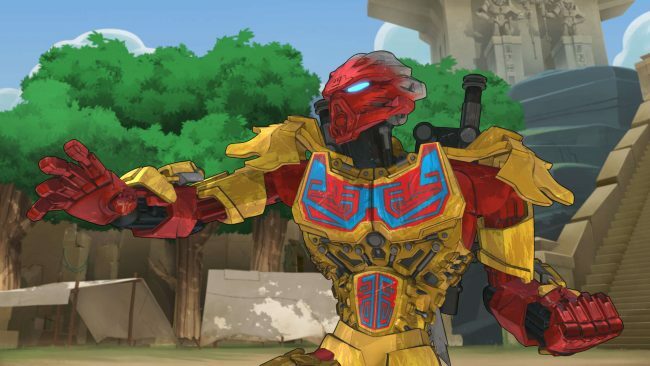 As an avid BIONICLE fan I find this adorable. It’s great to hear stories like this and how the brand is doing with the kids. Lego has somewhere said that the next episode airs in June, might give Oscar some relief.